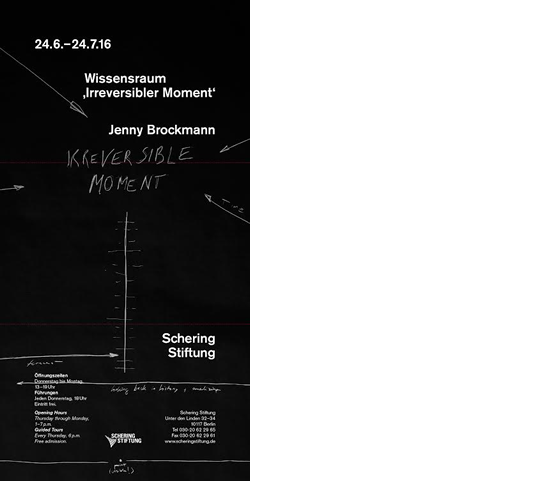 “The ‘Irreversible Moment’ is the point in a process after which nothing stays as it was before.” Berlin artist Jenny Brockmann uses these words to describe an instant, that is not easy to grasp, to which the exhibition Open Lab ‘Irreversible Moment’ at the Schering Foundation’s project space is devoted. The exhibition, curated by Nora Mayr, presents Jenny Brockmann’s artistic research of several years for the first time, a work emerging from cooperation between interdisciplinary experts from the fields of chemistry, physics, dance, and music. The starting point of her research is the causation behind fundamental changes in structures, spaces, political and personal situations, and for the sociopolitical significance of the ‘Irreversible Moment’. In this context the Open Lab ‘Irreversible Moment’ not only becomes a place to document the findings of previous investigations but also serves for the duration of the exhibition as an open laboratory, where visitors can participate in the research process at public lectures or in interdisciplinary workshops. For this Jenny Brockmann designs objects, architectural elements and information carriers, which carry out laboratory functions as well as opening a context for public discussion. Jenny Brockmann creates works characterized by discursive aesthetics. Besides autonomous objects, Brockmann’s works are always instructive examples and illustrative models of her artistic research as well. In the form of sculptures, interactive spatial arrangements or outlines of thought, for years now the artist has been researching into dynamic, spatial and social processes as well as natural cycles. Brockmann’s works are the starting point for philosophical discourse and questions about patterns of human behaviour and social structures. A project by Jenny Brockmann, curated by Nora Mayr, supported by Ernst Schering Foundation. In cooperation with the WILLMS NEUHAUS FOUNDATION, Chance and Creation, Humboldt-Gymnasium Berlin-Tegel, Dr. Viktor Bedö (Tacit Dimension), Kevin Bethke (Institute of Chemistry, Humboldt-Universität zu Berlin), Prof. Dr. Horst Bredekamp (Speaker Image Knowledge Gestaltung, Cluster of Excellence at Humboldt-Universität zu Berlin), Markus Georg (art educator) Franka Herwig (accordionist), Christina Landbrecht (Image Knowledge Gestaltung, Cluster of Excellence at Humboldt-Universität zu Berlin), Andreas Menzel (Institute of Physics, Humboldt-Universität zu Berlin), and Jeremy Wade (dancer, choreographer).